After failing to make the playoffs, DeAndre Jordan leaving for Dallas, and the Los Angeles Lakers signing LeBron James, it was a rough summer for the Los Angeles Clippers. 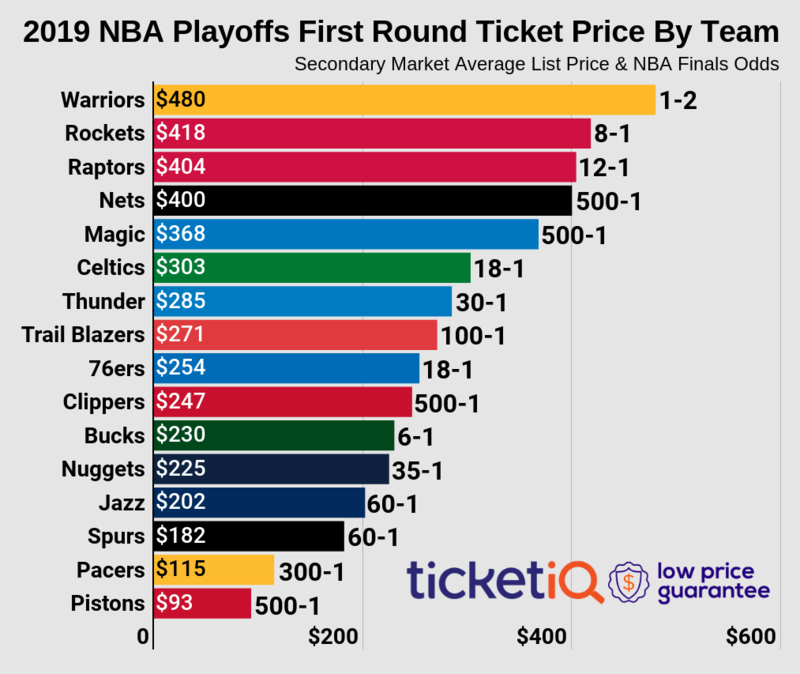 Put those pieces together and it's not too surprising to see Clippers ticket prices on the secondary market fall 29% from last season. 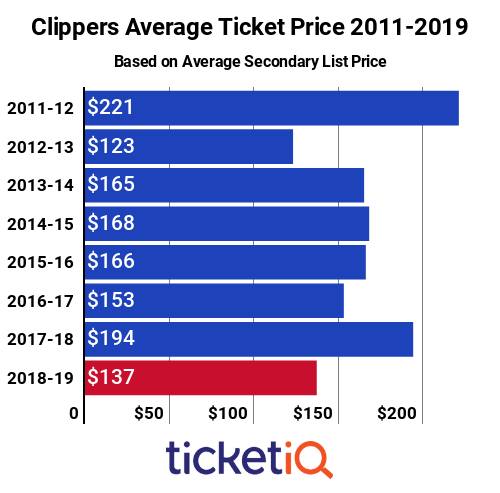 Below is how Clippers ticket prices stack up on the secondary market this decade. Clippers tickets are the second cheapest since 2011, when TicketIQ.com began tracking data. The most expensive ticket of the decade was $221in 2011-12, when the Clippers finished second in the Pacific Division, and the cheapest was $123 the following season, when they went on to win the division. The Clippers $137 average asking price ranks No. 18 in the NBA, down from No. 9 with a $194 average last season. The Golden State Warriors are ranked No. 1, with a $463 average asking price. Clippers season tickets are available through the team website, and season-ticket holders get access to exclusive team events and priority access to postseason tickets. Single-game tickets are available for most games through the Clippers primary market partner AXS, while the team directs fans to VividSeats for resale tickets. In addition, secondary ticket marketplace TicketIQ.com has seats available for all games. On the primary market, seats for the November 12 Golden State Warriors game start at $100 while TicketIQ.com has floor seats available starting at $497. 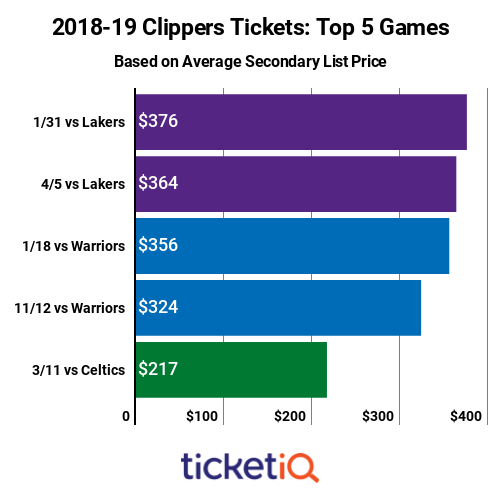 Four of the five most expensive Clippers games on the secondary market involve other California teams -- namely, the Lakers and Warriors. While the Lakers and Clippers have long had a cross-town rivalry, Clippers fans are likely driving up prices at Staples Center for the chance to see LeBron James in purple and gold. The priciest ticket of the season is $376 for the January 31 Lakers game, followed by $364 for the April 5 Lakers game. The next two most expensive are $356 for the January 18 Warriors game and $324 for the November 12 Warriors game. No. 5 on the list is $217, when the Boston Celtics come to town on March 11. Should the young Clippers put together a competitive season, ticket prices for any of the above games could rise. TicketIQ.com can get fans into Staples Center, with tickets to see LeBron and the Lakers starting at $112 on January 31 and $94 on April 5. Both sets of tickets come with the company's Low Price Guarantee.